Beverages and snacks are provided (lunch is not provided on evening outings). A deposit is required to hold your date. High Bridge is simply the name of the campground that sits at the confluence of Warren Creek and the North Fork of the Feather River. Both of this creeks flow from Lassen Park. The waters are inhabit with wild rainbows and browns. The fishing once away from the campgrounds is very consistent with fish pushing the 12” mark. The day usually starts with a small hike to get away from the civilization. Then we start to fish. Anglers in moderate to good shape should be choosing this trip. There is some rough walking and wading. 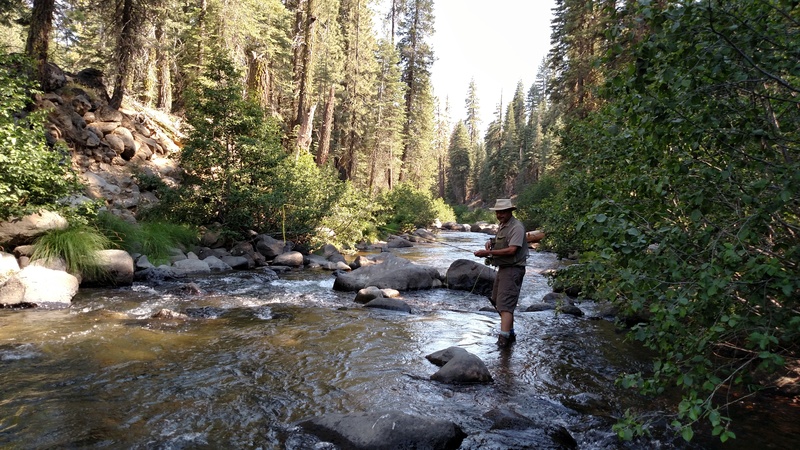 These creeks run cold all year with dry, nymph and streamer fishing. We use Tenkara rods for are main tactic of fishing. The Tenkara rod lets you high stick pocket water and swing streamers with easy casting.